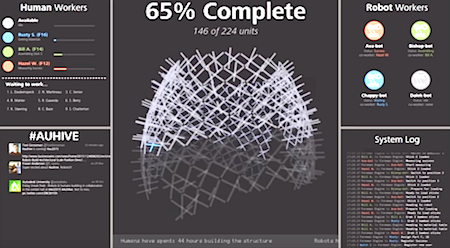 Autodesk University 2015 showcased their research and investments in future-facing technologies in manufacturing and AEC (architecture, engineering, and construction), such as IoT, 3D printing, and generative design. One of the words I heard often during the conference to describe Autodesk was ‘democratization’;2 not surprising given that AutoCAD was always priced much lower than most competing enterprise CAD systems.3 I also observed in our analyst session and other interactions with Carl Bass that he is a straight talker, not someone who talks in euphemisms or carefully crafted spin. I got the impression that is part of the engineering culture there as well—for example their sustainability initiatives (e.g. sustainable design, education, GHG emissions reduction) appear to be not done primarily for PR, but rather out of an inherent belief that it is the right thing to do. The keynote by Autodesk’s CTO, Jeff Kowalski, on Entering the Augmented Age, reinforced the futuristic ethos. He talked about the leap from passive tools used since the dawn of man where humans explicitly direct the tool, to generative design tools where the human merely provides the constraints and optimization goals for the design and the tool uses its own intelligence to synthesize optimized alternative designs. 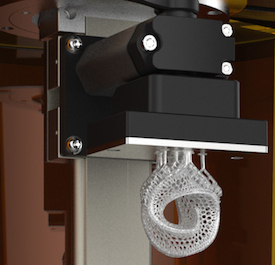 When combined with 3D printing, with its nearly free complexity (allowing the creation of previously unfabricatable parts), generative design can do some amazing things. An example of generative design was shown: the bionic partition, created by Airbus. 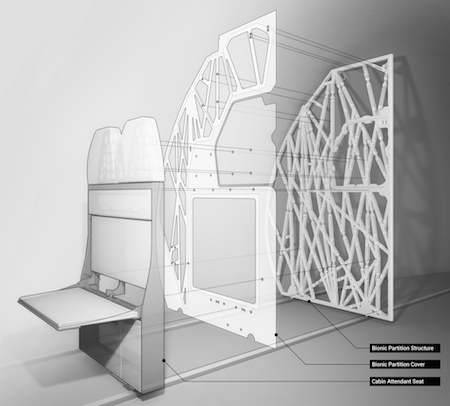 Airbus worked in partnership with R&D firm The Living4 (part of Autodesk) using generative design tools to create a new version of the partition that separates the aft galley from the passenger compartment in an Airbus 320. Later in the conference, David Benjamin, Founder of The Living, explained that generative design uses algorithms from biological evolution, which optimizes limited resources to create strong structures using the least amount of material. The computer can evaluate a very broad design space, literally millions of alternative designs and narrow it down to several thousand promising ones. Then the designer uses data visualization tools to view things like weight vs. strength plots and eventually arrive at the best high performing design … much better than traditional approaches. They also did a lot of digital testing, before even building a prototype including stress testing, stretch, compress, twist, bend, and so forth on both individual parts as well as the overall panel. The previous existing partition already had a strong, light, modern honeycomb design (everything in an airplane has already been optimized for minimal weight). However, using generative design, they were able to reduce the weight by an impressive 45% less than the already existing lightweight design (the goal was 30% reduction), while making the new version almost 10% stronger. This was so successful that they decided to start using this part in production A320s (once the part has been fully tested and certified). Jeff also talked about design tools beyond just generative design, that are intuitive (tools that learn, with no human intervention) and that are ‘empathic,’ i.e. systems that understand humans’ tastes, likes and dislikes. Next Jeff discussed robotic systems (they were everywhere at this show). He said that humans will be working side-by-side with robots more and more. Autodesk is working on applied research in this area, such as a robot to do high precision repetitive tasks in constructions like cutting holes in sheet rock for outlets and switches. Project Hive showcased this in the pavilion at the show—it was a structure being built by untrained volunteers (i.e. show attendees) working in concert with robots that were building the piece parts and a smartwatch-based interface to tell the people what to do next. 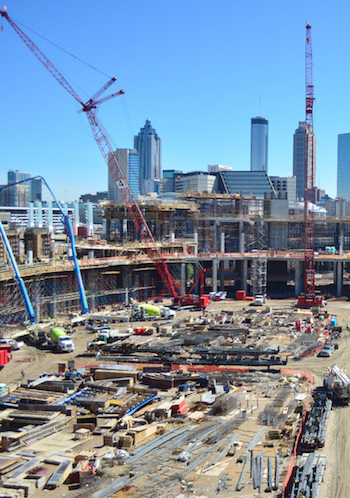 When I visited the Hive, it was 65% complete. During Jeff’s talk, he brought up Dr. Hugh Herr, from MIT Media Lab, who gave a moving presentation. Dr. Herr lost both legs to frostbite while doing mountain climbing. He was told he definitely would never climb again. Instead of accepting it, he designed his own artificial limbs. By designing the right prosthetics for the job, within 12 months he was able to climb even better than before. Today he is an MIT professor in Bionics, studying how the human body works in order to augment it. They are looking at how people walk, measuring the biomechanical characteristics (e.g. flexibility and compressibility) of the body’s components, building synthetic skins and mechanical and electrical interfaces between the built world and human body. They are growing nerves through micro tubes that will allow the wearer of a prosthetic to sense and control the limb directly using their own nervous system. He said, “It will be common for people in the future to wear bionic devices with their nervous systems extended out to the physical world. In this century we will systematically create technology that eliminates disabilities.” Dr. Herr was an inspiring example of the coming augmented age. CTO Jeff Kowalski used the nervous system analogy to segue into talking about connected objects and environments; ‘nervous systems’ for a building or city or machine. A specific example he gave was the Bandito Brothers5 car that Autodesk instrumented with all kinds of sensors, recording all the forces the chassis was subjected to while being driven through extreme maneuvers. 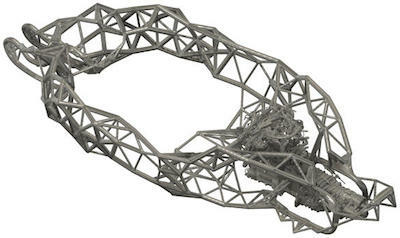 They took all of that real-world data and plugged it into their generative design tool, Dreamcatcher, and asked it to build a 3D printable chassis that could withstand those forces. This theme of using IoT sensor inputs to inform design was heard repeatedly and seems to be central to Autodesk’s vision for IoT. Amar Hanspal, Autodesk’s SVP Products, talked about Forge—an initiative that is roughly analogous to Salesforce’s Force.com, except Forge is focused on design and engineering rather than CRM. It provides a platform for software firms to build tightly-integrated sets of cooperating web service components and applications for the engineering and design community—everything from design, to manufacturing, field service, visualization—all with the design data at the core. The platform provides a consistent set of APIs that can work across the cloud, providing partners a way to develop their apps with common UI, administrative, and data integration. Amar said that Autodesk’s goal is for Forge to be the platform; the first choice for anyone developing design and engineering related solutions. In addition to the platform itself, Autodesk is creating a community, resources, and events to support developers. Next June they will host their first ever public Forge Developers Conference in San Francisco. Examples of early members of the Forge program include BRITEHUB, FATHOM, 100kGarages.com, MakeTime, Proto Labs, and HWTrek. The third leg of the stool for Forge is a $100M investment fund that Autodesk is running, similar to what they did with the Spark Fund for additive manufacturing (see below). Autodesk has been one of the first and most committed among CAD vendors to move aggressively onto the cloud. Two years ago, they launched Fusion 360 and also announced the integration of PLM 360 with NetSuite, all pure cloud-based solutions. Autodesk’s VP of Cloud Solutions, Scott Reese, talked about how production, construction, and fabrication are all changing and transitioning from sequential linear processes to more iterative design, flexible on-demand manufacturing, and connected products with as-a-service business models. All of these are driving the move to using the cloud, to keep everyone on the same page in a single version of the truth, regardless of who they work for; as well as provide a central repository for IoT data and enable Forge-based applications to work together. Autodesk’s core market of AEC is a great example of an industry where many players, from many different companies, work on very complex construction projects, with ever-changing designs, project status, schedules, and constraints—all of which must be tightly synchronized. The cloud helps keep everyone in sync, with an always up-to-date single-version-of-the-truth. Autodesk’s recent acquisition of SeeControl gets them rapidly into the IoT arena. I attended a session by Bryan Kester, SeeControl’s CEO and Founder and now Head of IoT at Autodesk, who said, “This is our launch event.” Bryan made it clear that their focus remains squarely on Industrial IoT, which most analysts (including us) are predicting will be much bigger than the consumer IoT market. The payback for reducing unplanned downtime in factories, transportation systems, mines, and other settings can be enormous. Cloud adaptation layer—an abstraction layer to reduce the complexity of dealing with the ‘zoo of protocols and devices.’ SeeControl has a constantly growing library and can add new devices pretty quickly. Complete white label approach—SeeControl lets manufacturers put their own branding and look and feel on the software without worrying about being in the software business. For a manufacturer’s distributor network they can provide multi-tier white labeling—i.e. a tool that lets the distributors’ brand the solutions as their own. From Usage Visibility to New Business Models—SeeControl enables the ability to understand how people are using the product, as well as test out new concepts to see how they are received, and easily have the product receive software updates. Bryan said one of their customers developed a ‘sales alert’ algorithm that predicts when a customer would need or want to buy a new product. The other big change for manufacturers is the shift in business model, moving from a break-fix model selling parts or maintenance to full-on services or in some cases product-as-a-service. Three Steps to Creating an IoT Application—Bryan walked through the three main steps of creating an IoT application using SeeControl. First was creating a digital twin6 of the product, by adding fields for each of the sensors (e.g. temperature, RPM, etc. ), and other attributes such as color, model number, serial number, as well as analytic data like failure types and quantities. These attributes can be reused in different variations of a product or object that share common attributes. Next is linking devices (e.g. a temperature sensor, for example) from their device library to the attributes in the virtual model. This mapping looked like a quick pull-down list selection process. SeeControl also has provisioning tools, such as wireless service management from several partner firms, including KORE, Verizon, and Jasper. The third step Bryan described as sort of ‘Visio meets Excel,’ creating a visual workflow diagram into which you can put prebuilt functions and formulas or your own algorithms. This does both real-time and historical analytics. It can pull in data from other sources besides the object itself, such as weather, other IoT systems or enterprise systems, and can send data off to ERP systems or other analytics tools as well. Simple processes can be run standalone right there in the tool. The data is delivered to the desktop browser in a dashboard format. They have already integrated Autodesk's A360 Viewer, so you can overlay a 3D model of the object on which you can see where things are happening. The tool also creates a ‘universal’ mobile application right out of the box that can run on the most popular mobile devices. Cloud also helps in tightly coupling the Design-Make-Use cycle. Changes made in design can automatically propagate through to manufacturing and field service. Data collected out in the field via sensors about how the product is being used and how it is performing is made more easily available for analysis and feedback into the design cycle via the cloud. In recent years, Autodesk has invested more in the “Make” phase, such as their major investments in 3D printing. Now, the increasing importance of IoT and the acquisition of SeeControl has pulled Autodesk more fully into the “Use” phase, making them more of a full lifecycle provider. As part of the SeeControl launch announcement (see sidebar) we heard from David Keeley who manages Engineering for TSM Control Systems. They make gravimetric7 blending and control systems that control the flow of materials for blending and batch production of plastics and other materials to make things like pipe and tubing, blow moulding, blown film, extrusion coatings and much more. A 40+ year-old company, TSM already has a huge installed base of industrial machinery. As the ‘brains’ of these production machines, their device already generates many gigabytes of data out in the field, but up to now it has been locked up in the machines and not available for applications (outside of local control). Spark Platform—An open platform (APIs and SDKs) and a connected ecosystem of providers8 of 3D printing hardware, software, materials, and services. Ember—An open source, production quality, DLP stereolithography 3D printer, with 50 micron XY resolution (about two thousandths of an inch) and 10-100 micron Z resolution. Spark Investment Fund—A $100M fund to accelerate advancements in 3D printing. Carl Bass said Autodesk does about 10 to 15 acquisitions per year, with many of them being ‘acquihires’ of smaller firms that have breakthrough technology and passionate talent. He said it is fairly rare for them to buy a larger mature firm, though it does happen. He also talked about their philosophy towards interns, saying, “We value the insights that come from young people. They are not empty vessels, but have a well-founded point-of-view on what the future will look like that we like to tap into.” I saw this in action as Autodesk had some interns use the newly acquired SeeControl platform to build an IoT application for a self-propelling robotic ball. I saw how seriously the Autodesk team listened to and incorporated what was learned from that process. Research Scientists, Advanced Materials Specialists, and Data Scientists, Oh My! One more example of Autodesk’s future-facing orientation was a session I attended, “The Future of Making Things is Here—Generative Design and Additive Manufacturing,” a panel discussion of Autodesk personnel in advanced manufacturing, research, and 3D printing. 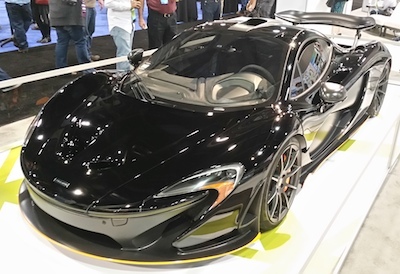 Their broad ranging discussion covered areas like new materials with inherent sensor capabilities (a carbon fiber that tells you how much it’s being flexed and stressed), new 3D printing beyond SLS (Selective Laser Sintering), how people are tackling the relatively high failure rates of additive manufacturing and much more. The brainpower and knowledge on the panel highlighted for me the investments that Autodesk makes into research and advanced technology. I met a number of Autodesk’s research scientists of various types at the show, such as in materials science, manufacturing technologies, data analytics, and generative design to name a few. This was my first Autodesk University and first broad exposure to Autodesk as a whole. The acquisition of SeeControl is what drove our interest and participation, since IoT is central to our research. It seems to me the SeeControl acquisition will drive Autodesk deeper into manufacturers’ ‘use’ phase, especially in the area of service and new business models. Having an engineering background myself, I appreciated Autodesk’s no-nonsense and inquisitive/future-investing culture. They seem to be investing in many of the right areas to align with where manufacturers and the AEC industry are headed. It will be fascinating to watch them co-create the future with their partners and customers.